This featured neighborhood tour is a sample of the neighborhood tours that this site will provide in the very near future. Please check back very soon! Dorset Park, South Burlington, VT is a townhome neighborhood situated on eleven acres of common land. These homes were built between 1988 and 1994 and offer 2-3 bedrooms and 1.5 to 2.5 baths and vary in size between about 1,600 and 2,000 square feet. Floor plans vary and may include features such as a formal dining room, family room, first floor master bedroom, fireplace, skylight, mudroom, covered porch and six panel doors. All homes have an oversized attached garage with extra storage space. Natural gas heat is a bonus as well. Some models have vaulted ceilings with a second floor loft. The kitchens are generously sized and offer lots of cabinet and counter space while some homes also have a breakfast bar. A pass through between the kitchen and dining rooms adds to the open feel of the home. The bedrooms are very generously sized and offer copious closet space. Some homes offer a master bedroom suite with private bath and large walk-in closet. End unit homes offer the bonus of more natural lighting that just seems to brighten the whole house. A private deck, patio, screened porch or sunroom will help you enjoy the back yard. Many homes have a private location backing to woods while other homes have a stunning pond view. This neighborhood is very scenic with lots of mature landscaping and natural scenery offering a park like setting. This is a quiet and peaceful neighborhood where pride of ownership is apparent. These homes are well cared for and offer great amenities such as an outdoor pool, tennis courts, club house and playground. A wonderfully quiet country location, yet close to everything. 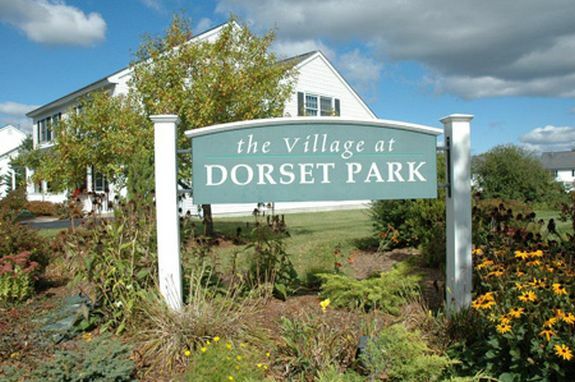 Dorset Park townhomes are close to the Dorset Park, nature trails, community gardens, golf course, South Burlington Middle and High Schools, library and University Mall and are within a short drive to UVM, Fletcher Allen Hospital, shopping, I-89 and downtown Burlington. Nearby Dorset Park offers ball fields, a large playground and an ice skating/hockey rink. You are also very close by to the South Burlington Bike Path. Children benefit from the exceptional South Burlington school system and will attend school at South Burlington Central School, Frederick H. Tuttle Middle School and South Burlington High School. Homes in Dorset Park are priced between about $235,000 and $260,000.